Even in death, Ol’ Glory Bones is as patriotic as he ever was – so patriotic in fact, his very skull is covered in stars and stripes! Some declare he was born that way, but, really, who’s to say? After all, no one got a peek at his cranium until the flesh faded away after his fateful passing. Ol’ Glory Bones’ heart may not beat, but the mythic icon endures in the patriotic spirit of proud, strong Americans everywhere. 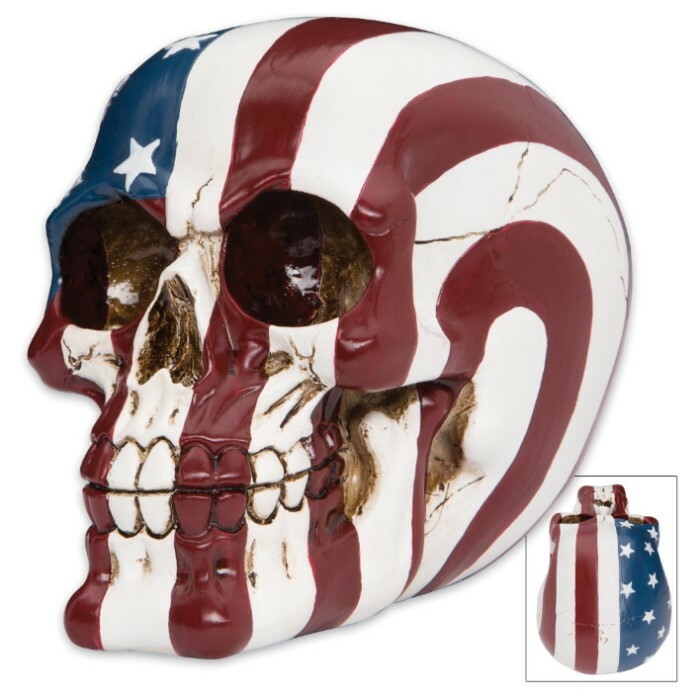 Show your love for the USA with this exquisitely detailed ornamental skull sculpture, decked out in a vibrantly colored “stars and stripes” motif – a cool, unique way to display the American flag. Fine, authentic touches like joints and fractures enhance the skull’s realism, while a bony furrowed brow gives Ol’ Glory Bones an enduring tough, resolute expression. 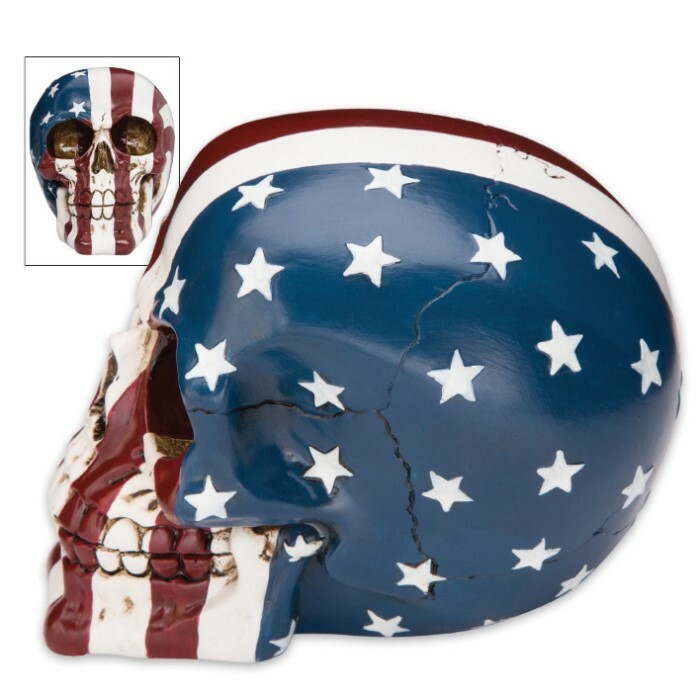 The skull is forged with durable cold cast resin, made to last a lifetime. Proudly display Ol’ Glory Bones on your mantle, desk, coffee table, dresser – anywhere you want to declare your patriotism for all to see. 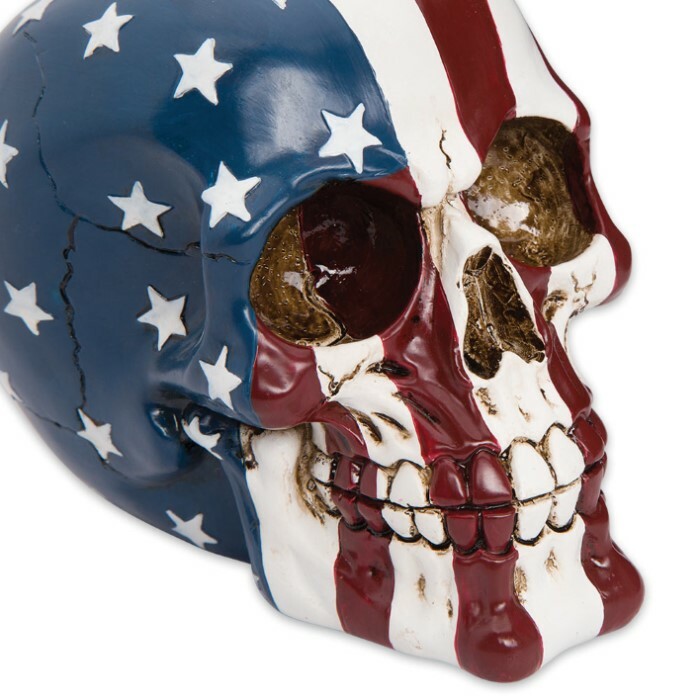 Ol’ Bones’ skull is a bit smaller than the average human’s, but at 4 1/2" high x 4” wide x 5 1/2” deep it’s ideally sized for home décor – amply visible but fits easily on most furniture or fixtures. You won’t find Ol’ Glory Bones anywhere but here, and if he had written a will, we’re sure he would’ve decreed your home as his final resting place. Don’t let the ol’ boy down! Bring him home today to rest in peace.